Introduction: The nonadjustable gastric band (NAGB), sometimes referred to as gastric segmentation, was a common surgical treatment for morbid obesity in the 1980s. A paradigm shift from nonadjustable gastric bands (NAGB) to adjustable gastric bands (AGB) has resulted in fewer complications. 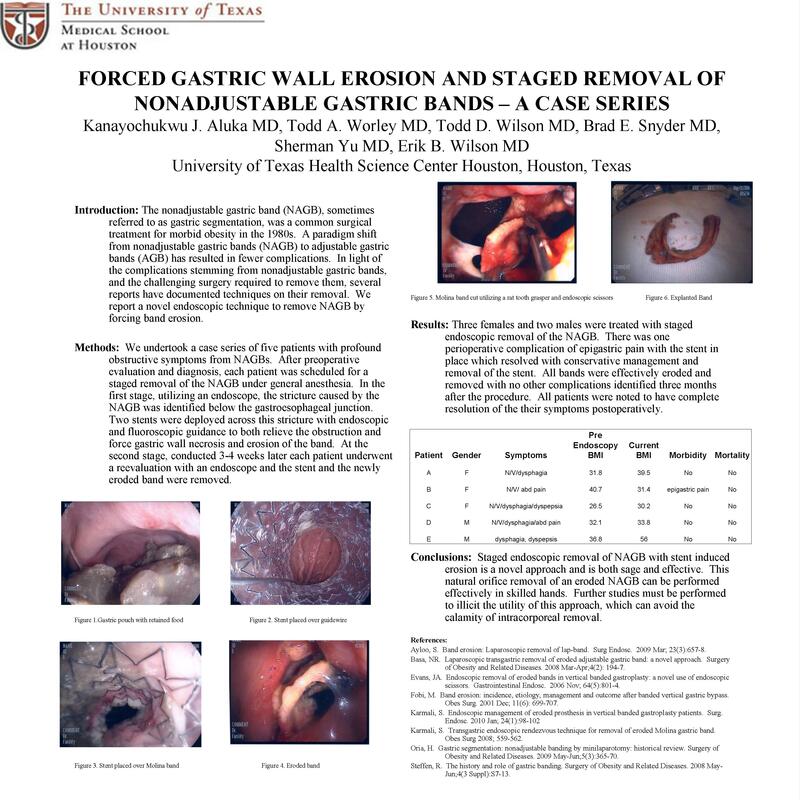 In light of the complications stemming from nonadjustable gastric bands, and the challenging surgery required to remove them, several reports have documented techniques on their removal. We report a novel endoscopic technique to remove NAGB by forcing band erosion. Methods: We undertook a case series of five patients with profound obstructive symptoms from NAGBs. After preoperative evaluation and diagnosis, each patient was scheduled for a staged removal of the NAGB under general anesthesia. In the first stage, utilizing an endoscope, the stricture caused by the NAGB was identified below the gastroesophageal junction. Two stents were deployed across this stricture with endoscopic and fluoroscopic guidance to both relieve the obstruction and force gastric wall necrosis and erosion of the band. At the second stage, conducted 3-4 weeks later, each patient underwent a reevaluation with an endoscope and the stent and the newly eroded band were removed. Results: Three males and two females were treated with the staged endoscopic removal of the NAGB. There was one perioperative complication of epigastric pain with the stent in place which resolved with conservative management and removal of the stent. All bands were effectively eroded and removed with no other complications identified three months after the procedure. All patients were noted to have complete resolution of their symptoms postoperatively. Conclusions: Staged endoscopic removal of NAGB with stent induced erosion is a novel approach and is both safe and effective. This natural orifice removal of an eroded NAGB can be performed effectively in skilled hands. Further studies must be performed to illicit the utility of this approach, which can avoid the calamity of intracorporeal removal.